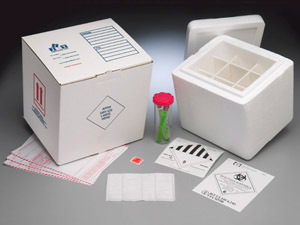 Bioship 602SS ITCK Infectious Temperature Control Kit has an airtight pressure vessel (secondary container), complete with biohazard label, absorbent pouch, infectious substance label, dry ice label, shipper's declarations, instructions, positioning insert, cooler and outer fiberboard box. This package system meets all requirements of IATA/ICAO Packing Instruction 602 for air shipment, and all requirements of domestic and international regulations for ground transportation of infectious substances. This kit is for the customer that needs a compliant, infectious substance dry ice shipper that they can afford. The secondary container is 6" tall. Meets the requirements of IATA/ICAO Packing Instructions 602 for shipping Infectious Substances by air, as well as CFR 49 § 173.196 for ground transportation of these items. Secondary container has an easy open positive lock closure. Secondary container passes 95kPa and offers high impact resistance. Secondary container is clear to see potential leakage before opening. Outer dimensions of package are 11 1/8" x 9 5/8" x 10 7/8". Inside dimensions of cooler are 7 7/8" x 6 3/8" x 7 7/8". This package holds approximately 10 lbs of dry ice. Under average conditions the contents are kept under -18 degrees C for 72 hours. Pricing listed is per kit which consists of one assembled unit. Additional discounts are available for larger quantities, please call for pricing.